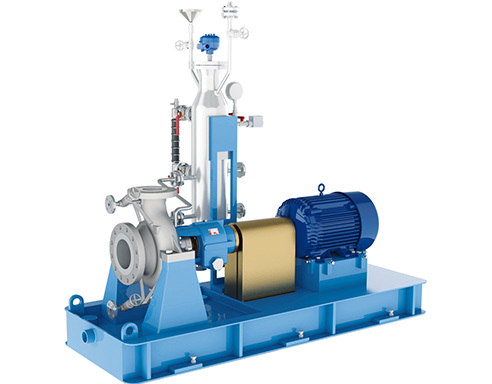 The separation of liquid chamber/ atmosphere by means of an isolation shell is the best solution to pump aggressive, explosive and toxic liquids, hydrocarbons, heat transfer liquids and liquids difficult to seal. The hermetic sealless is the best solution for the chemical, pharmaceutical, oil and gas and petrochemical industry. 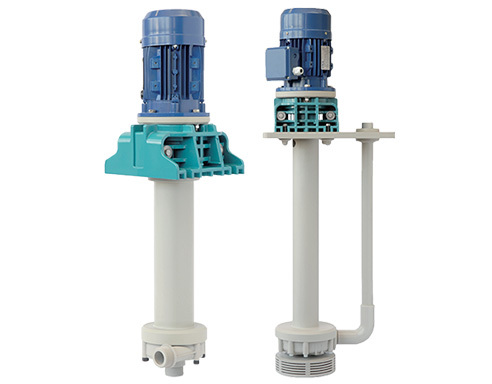 M PUMPS CN MAG-M Magnetic drive pumps are sealless pumps.The static rear containment shell forms a closed system with hermetically sealed liquid end. 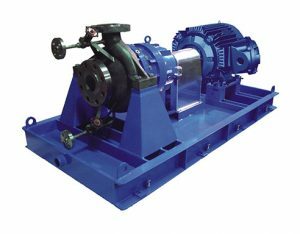 M PUMPS CN MAG-M Magnetic drive pumps are designed to improve people and plant safety. Especially when toxic, explosive or other dangerous liquids which react on contact with the atmosphere. For all these services rear containment shell replaces double mechanical seals with external fluid reservoires and all the required control devices. CN MAG-M pumps offer therefore exceptional benefits to the chemical, petrochemical and allied industries. CN MAG-M pumps have no glands, no seals no valves. Contrary to sealed centrifugal pumps, the hermetic construction of the CN MAG-M mag drive pump ensures a safe and leak free operation. Even under heavy-duty applications the pumps are extremely reliable. 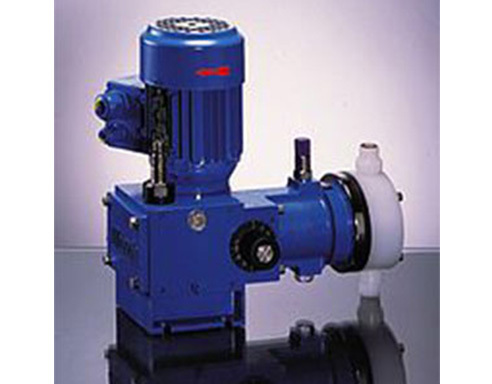 The mag drive pumps have an extended choice of materials as well as a wide variety in models. 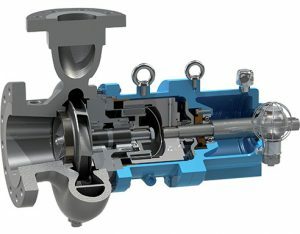 With its 100% zero leakage mag drive coupling the M PUMPS mag drives are your problem solvers in fluids and chemicals transfer. 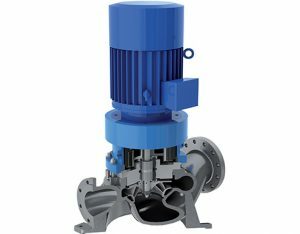 M PUMPS CN MAG-M are a single stage volute casing pumps with closed impellers, back-pull-out design, with end suction and top discharge flange. Centerline legs are provided as standard for foot mounting on the base plate. Capacity and outer dimensions according to API 685. 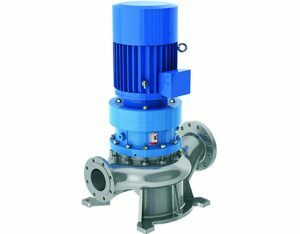 M PUMPS CN MAG-M mag drive pumps can be supplied to meet the requirements of Directive 94/9/EC, with ATEX certification II -/2 G cbk II C Tx for installation in potentially explosive atmospheres. 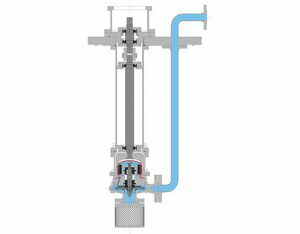 As the internal circulation from discharge to suction, doesn’t rise the temperature in the pumped liquid the handling of boiling liquids is possible without an increase of NPSH-required. The thrust loads of the closed impellers are totally balanced by back vanes. Minimum residual forces that act in suction flange direction, are beared by strong silicon carbide, spring mounted, thrust bearings. – Titanium, or others available on request. The bearing materials available are of three different types to provide the best solution for each application: Silicon Carbide (SSIC), Tungsten Carbide (TC). The use of elastic rings reduces the sleeve bearing loads and the thrust bearing loads to a minimum, to guarantee many years of maintenance-free operation. Rear shell is made of one single piece, no welding, ellipsoidal profile that has been studied to withstand higher pressures than the traditional one. Hastelloy® C276 is standard isolation shell material – providing a safe and effi cient solution – system pressure max 16 bar. Hybrid rear casing technology available for energy saving configuration. Titanium Alloy is an upgrade when higher pressure ratings and increased efficiency are required. Double rear shell on request. The high performance magnets can be operated at liquid temperatures of up to 662 °F (350°C) without external cooling. Transmittable horsepower exceeds 520 kW / 700 HP. Special bare frame design allows the adoption of secondary containment and secondary control systems, in full comply to API 685 latest edition. Connections for resistant temperature detection elements, liquid and shell surface control are available as standard. Monitoring devices for outer ball bearing are also available on request. 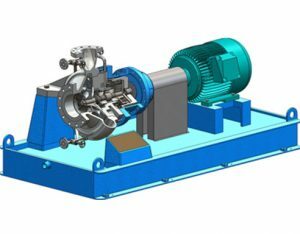 When the pump is operating, the heat generated in the containment shell and inner magnet area by eddy currents, is dissipated by an internal flow circulation from the discharge directly behind the impeller. The pressure is increased by the rear impeller back vanes circulation and come back to discharge. Double rear shell Hastelloy®C276 is our standard isolation shell material -providing a safe and efficient solution – system pressure max 150 bar. The shaft is supported by two strong sleeve bearings The stationary bearings are located centrally in the common bearing housing, which ensure the proper alignment for a true running. Standard material is pure alpha grade – Syntherized Silicon Carbide, highly resistant against corrosion and wear. The Silicon Carbide parts are elastically mounted by tolerance rings, beared and designed for temperatures up to +662&°F (+350°C) without heat exchanger. Higher temperature on request. For critical applications, like extreme low viscosity, or liquids with solid particles, special configurations with intermediate seal are available. The intermediate seal separates the process fluid from the magnetic cell, that is lubricated by an external flushing circuit. The external lubrication can be cooled by an additional external cooling system, in this way CN MAG-M pumps can reach very high temperature (up to 450°C). Jacket version available, in different configuration, for casing, shaft support and bearing support heating, by steam or water. – Maximum capacity up to 4000 mc/h, differential head up to 220 m.
to +662°F (+350°C) without external cooling. – The maximum allowable working pressure 50 bar for the standard version and 150 bar for HP Version, higher pressure version available on request. RWP QUICK CHANGE CARTRIDGE KIT to guarantee an easy and fast maintenance. Tungsten Carbide (WC), Special Carbon to allow a dry running situation and PTFEC/G for any applications where the Special Carbon cannot be used. Available two versions, AISI 316 the standard construction, and Hastelloy® C276 for high pressure version – providing a safe and efficient solution – system pressure max 150bar. Custom design base plate,stainless steel. Vertical construction adopts V1 IEC motor standard. Base flange designed on customer specification. Threaded BSP (GAS) & NPT. 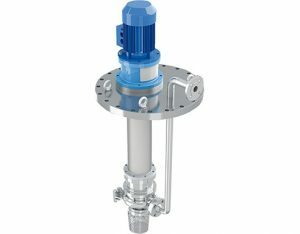 The separation of liquid chamber/ atmosphere by means of an isolation shell is the best solution to pump aggressive, explosive and toxic liquids, hydrocarbons, heat transfer liquids and liquids difficult to seal. The hermetic sealless is the best solution for the chemical, pharmaceutical and petrochemical industry. – Custom design base plate, stainless steel, carbon steel, other materials available. Bearing materials are available in four different types to provide the best solution for each application: Silicon Carbide (SSIC), Tungsten Carbide (WC), Special Carbon to allow a dry running situation and PTFEC/G for any applications where the Special Carbon cannot be used. Vertical construction adopts V1 IEC motor standard. Base flange designed on customer specification.